Also known as a Battery Bolt. The Square head offers greater bearing surface for wrenching than standard hex head bolts. Flat Cap Screws are most often used for assembling close tolerance machinery where head clearance is critical. Grade 2 Steel used in non-critical applications where not subject to extreme temperatures or excessive stress. Grade 5 used when greater tensile strength needed. Yield-to-tensile ratio is the lowest of all heat treated steels. Greater tensile strength than Grade 2 or Grade 5. For use in high stress applications. Grade 2 Steel used in non-critical applications where not subject to extreme temperatures or excessive stress. Square Neck keeps the bolt from turning as the nut is tightened. Flat Head allows a lower profile Ribbed Neck used in softer materials to keep the bolt from turning when the nut is being tightened. Designed specifically for use in the installation of garage doors. Ribbed Neck used in softer materials to keep the bolt from turning when the nut is being tightened. For use in softer materials as the larger diameter head will not pull through. Also preferred for its lower profile. Commonly used in conveyor/elevator systems. Large head also preferred where low profile required. To use as a temporary, light duty fastening system. Also known as Bent Bolts or Turned Eye Bolts. Grade 5 Steel for medium wear. Countersunk flat head with square necks allow better resistance to the wear from heavy duty applications. Grade 8 Steel for heavy duty wear. Countersunk flat head with square necks allow better resistance to the wear from their heavy duty applications. Locking Serrations keep a tight grip when loosening forces are present. Flanged Head provides greater bearing surfuce and eliminates need for a washer. Generally used for automotive applications. Flanged head provides greater bearing surface and eliminates the need for a washer. For use in heavy duty construction applications. 120/105 ksi minimum tensile strength as per ASTM international standards. Part wood screw, part machine screw. Also known as Table Leg Bolts as they are often used in furniture manufacturing. A307 steel for non-critical applications. Generally used in pre-tapped holes where application requires a fully threaded bolt. Grade 5 for higher tensile strength. Generally used in pre-tapped holes where application requires a fully threaded bolt. Often used in light automotive applications. Part wood screw, part machine screw. Also known as Table Leg Bolts as they are often used in furniture manufacturing. Partially threaded. DIN Metric Standard. DIN Grade 10.9 (similar to Grade 8) has a greater tensile strength than Grade 8.8 (similar to SAE Grade 5). Fully threaded. DIN Metric Standard. DIN Grade 10.9 (similar to Grade 8) has a greater tensile strength than Grade 8.8 (similar to SAE Grade 5). DIN Metric Standard. Flanged head style provides greater bearing surface and eliminates need for washer. on another project do you know of a inexpensive source of a “house-mate 7mm x 50mm hex in zinc or chrome ? The generic description to the part you are looking for would be a Pancake Head Hex Socket Drive Wood Screw. These might also be referred to as Furniture Screws. Searching on these descriptions, you can find sources ranging from Asian manufacturers to more local distributors, depending on the quantities you are looking for. From what I can see, if you are only looking for a handful of these screws, Home Depot might be the right source for you. I suppose you are right it is most like a T-Bolt but the top is flat and more like the bolt that I mentioned previously. I am thinking it most looks like a binder bolt but with a higher profile. The problem with side gripping (bolt) the hole is that it is going into a plastic resin material known as 3form which, I fear, is not forgiving and will likely crack when pressure is put on it. this low head screw but instead of the allen head drive it is flush on the top. It is held by changing the circular shape to an oval (but not recognizable). the other end take what ever nut you desire. So the driver, to hold it, is the opposite of the oval. In other words an inside oval (similar to a socket wrench but smooth and ovular. Is that clearer? Your description is clearer, but we are still not recognizing the part you are looking for. Now, if you happen to have a sample of the part that you are looking for, may we suggest that you to take a picture of it and email it to us at aspeninfo@aspenfasteners.com. Copper Energy Mexico SA de CV is a Mexico based company. We are Importers, Distributors, and Commercial Agents, supplying industrial materials and tools to Manufacturing plants, Factories and general industries all over the Mexican territory. Please provide export price list. This would be our initial order, and we plan to re-order with high frequency and higher quantities. Thank you very much for your inquiry. As this web site is a dedicated resource center, we do not actually sell any fasteners from here. I have taken the liberty of forwarding your request to our commercial site ( http://www.aspenfasteners.com ) who can be reached at any time by email ( aspensales@aspenfasteners.com ) or by phone (1-800-479-0056 ). Many thanks for taking the time to contact us. I am looking for a machine bolt that I specified some time ago, similar to an elevator bolt but higher head, that seems to have no observable driver mechanism. It is actually an oval shape that with the reciprocal driver head it can be tightened. Does this sound like anything you have come across? It sounds to me that you are looking for a Carriage Bolt as this is a similar fastener design as an Elevator Bolt and does have a higher and rounded head. You can take a closer look at Carriage Bolts here: http://www.aspenfasteners.com/Carriage-Bolts-s/75.htm. Is this what you had in mind? Carriage Bolts, like Elevator Bolts, have a specifically shaped portion of the shank, right under the head of the fastener, that provides the locking/holding mechanism during assembly that would normally be taken care of by the head style or drive recess of fasteners like Hex Bolts (http://www.aspenfasteners.com/Hex-Head-Tap-Bolts-s/130.htm) or Socket Cap Screws (http://www.aspenfasteners.com/Socket-Products-Socket-Cap-Screws-s/1139.htm). 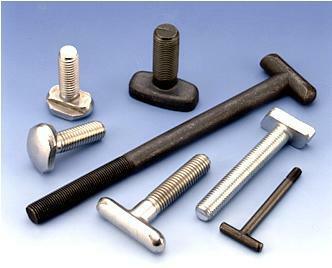 In the case of Carriage Bolts, the most common locking/holding mechanism is the “square neck” (http://www.aspenfasteners.com/Carriage-Bolts-Round-Head-Square-Neck-s/79.htm). Another variation would be the “ribbed neck” (http://www.aspenfasteners.com/Carriage-Bolts-Round-Head-Ribbed-Neck-s/89.htm). 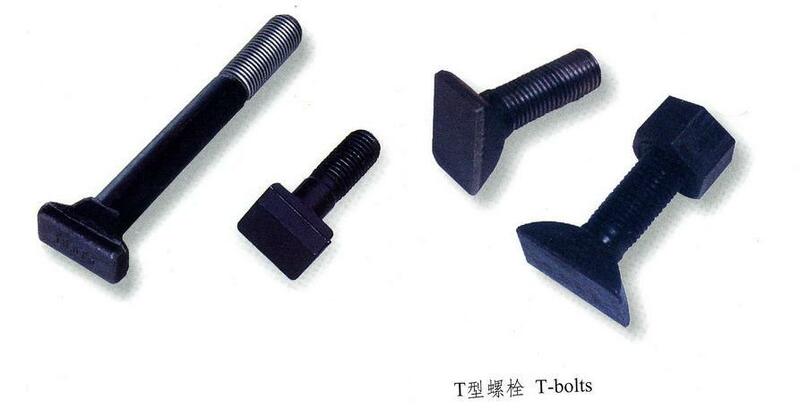 Less common is a Carriage Bolt with an oval shaped neck that is sometimes referred to as a “Track Bolt”. This is an older design that is not commonly used anymore. I hope this answers you questions. If not, please feel free to get back to us and we’ll try to help you as best we can!